Ishtar, Inanna, Ishtar goddess, venus, venusses, goddess, prehistoric goddesses, goddess statues, sumerian goddesses, babilonian goddesses. Louvre Museum, Paris. 2000 B.C. 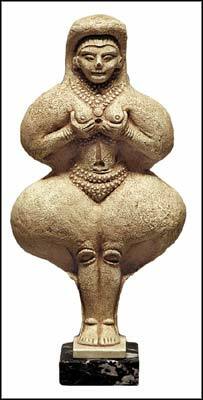 So common in the Mesopotamian area were the clay figurines of Ishtar/Inanna/Ashtart in her characteristic breast-offering pose, that this has come to be known among archaeologists as "The Ishtar Pose". She was addressed as"Mother of the Fruitful Breast", Queen of Heaven, Light of the World, Creator of People, Mother of Deities, River of Life, Etc. The breast-offering pose suggested her function as the Goddess of all nourishment and fertility. Ishtar, also known as Innana in Sumeria is, above all, a lunar Goddess who gives life as the waxing moon and then withdraws it as the waning moon. The light and dark dimensions to her power, her dying and resurrected son-lover Tammuz, who annually descends to the underworld and rises again from it-all suggest a lunar mythology which revolves around the connection made between the light and dark lunar phases and rhythmic alteration of the Earth's fertility.